Handicapper Micah Roberts said a case can be made for up to 20 drivers to win, including Ryan Blaney at 12-1, Aric Almirola and Erik Jones at 20-1, Denny Hamlin at 25-1, Daniel Suarez, Austin Dillon and Ricky Stenhouse Jr. at 50-1 and Ryan Newman at 80-1. Bettors who’ve banked on a long shot to take the checkered flag at Las Vegas Motor Speedway are running on empty after 22 NASCAR Cup Series races there. Favorites have dominated at LVMS since it hosted its first Cup race in 1998. Only five active drivers have won at LVMS and all are former Cup Series champions: Kyle Busch, Brad Keselowski, Kevin Harvick, Martin Truex Jr. and Jimmie Johnson. But that might change in Sunday’s Pennzoil 400, where NASCAR’s new competition package — which reduced horsepower from 750 to 550 — promises to produce more competitive racing than in past years. “The new car opens it up to a whole new cast of characters who have the ability to win,” said Roberts (Sportsline.com). “No one’s going to run away with it. There will be a lot more passing. Roberts, a former Las Vegas sportsbook director, said a case can be made for up to 20 drivers to win, including Ryan Blaney at 12-1, Aric Almirola and Erik Jones at 20-1, Daytona 500 winner Denny Hamlin at 25-1, Daniel Suarez, Austin Dillon and Ricky Stenhouse Jr. at 50-1 and Ryan Newman at 80-1. “Suarez can win because of his affiliation (with Stewart-Haas Racing and teammates Harvick, Almirola and Clint Bowyer),” he said. “Fifty-to-one on Suarez is pretty good. The wagering handle on the Pennzoil 400 dwarfs every other NASCAR race besides the Daytona 500, which like the Masters is open for betting months beforehand. Las Vegas books offer an expanded menu of props and driver matchups for the Pennzoil 400, including a matchup of the homegrown Busch brothers: Kyle is a minus 220 favorite over Kurt (plus 190). Kyle Busch also is a minus 200 favorite to win Friday’s Strat 200, the 6-1 favorite Friday to win the Pennzoil 400 pole and the minus 125 favorite to win Saturday’s Boyd Gaming 300. 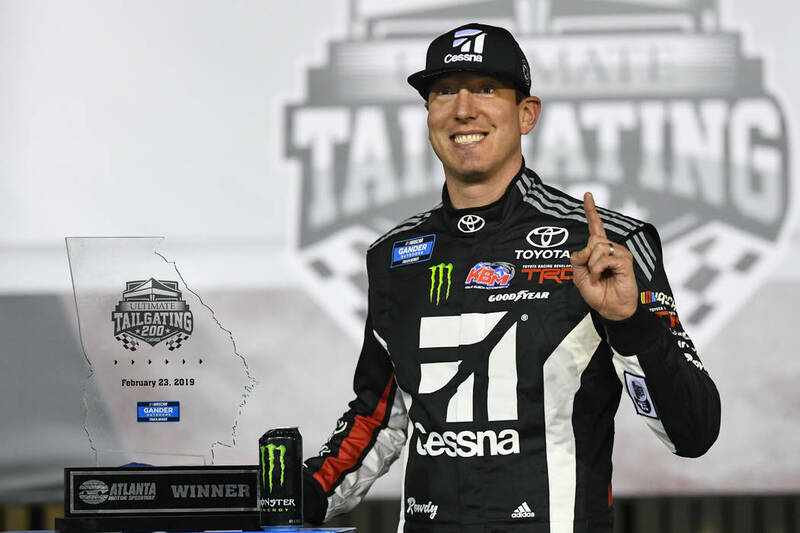 He’s the 5-1 second choice to win the Pennzoil 400 behind Harvick, the 9-2 favorite who won at LVMS in March 2018 for his second victory in five races there. Roberts likes Elliott to finish in 13th place or worse in Sunday’s race. Keselowski won at Atlanta on Sunday and won at LVMS in September. Keselowski is the 6-1 third choice to win the Pennzoil 400 and a victory would tie him with Johnson (30-1) for the most Cup victories at LVMS with four. More betting: Follow at reviewjournal.com/betting and @RJ_Sportson Twitter.